SPIDER-MAN: Into the Spider-Verse hits theaters today and with all the amazing reviews flying around the internet, I hardly need to tell you to go see it, but GO SEE IT! Disclosure: We attended a pre-screening. All opinions are our own. 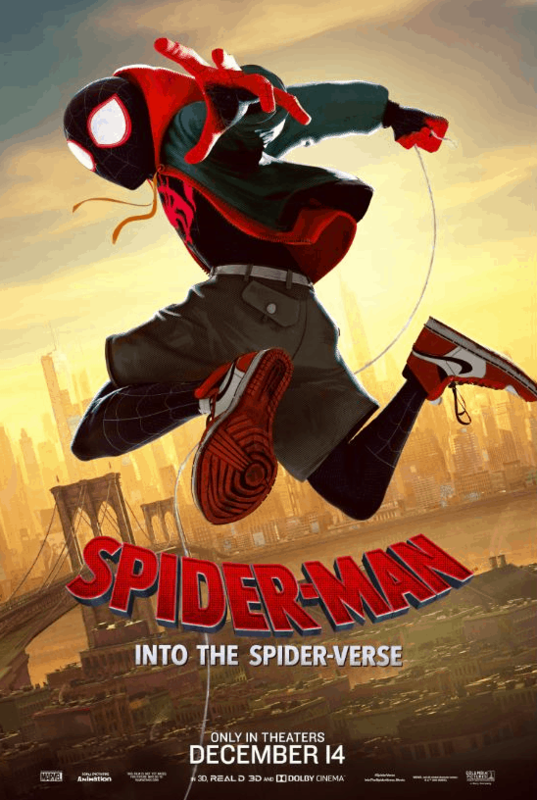 SPIDER-MAN: Into the Spider-Verse follows Miles Morales, a young teen from Brooklyn, who through a pretty sweet backstory, ends up getting that fateful bite from the radioactive spider we know all too well. He ends up meeting THE Peter Parker and soon realizes that he is not the only person (or pig) with these unique abilities. Miles must learn to harness his new skills to battle the Evil Kingpin as he opens portals to other dimensions, while helping his new spidey friends get back to their own dimensions as well. My son is just starting to get into superheros and has been obsessively watching the first SPIDER-MAN for the last few weeks. He was elated when he found out we were going to see the “new Spiderman” in the theaters. I was a bit apprehensive myself as I am not super big into superheros. The crowd in the theater was different than the typical movies that we pre-screen and I was a little out of my comfort zone because I have not followed the Story of Spider-man very closely. However, the movie was exceptional. Humor, Sadness, Action and even an appearance from Stan Lee made this movie a big hit for everyone in the theater. It truly is a must see and there is a reason why rotten tomatoes is giving it 100%! Want a little sneak peak into SPIDER-MAN: Into the Spider-Verse? Check out the sweet trailer, it is just the beginning of this awesome movie! Before we even left the theater, the kids were asking to see it again and even my husband was raving about how good it was (that man is hard to impress too). SPIDER-MAN: Into the Spider-Verse opens today (December 14th) and is playing EVERYWHERE!